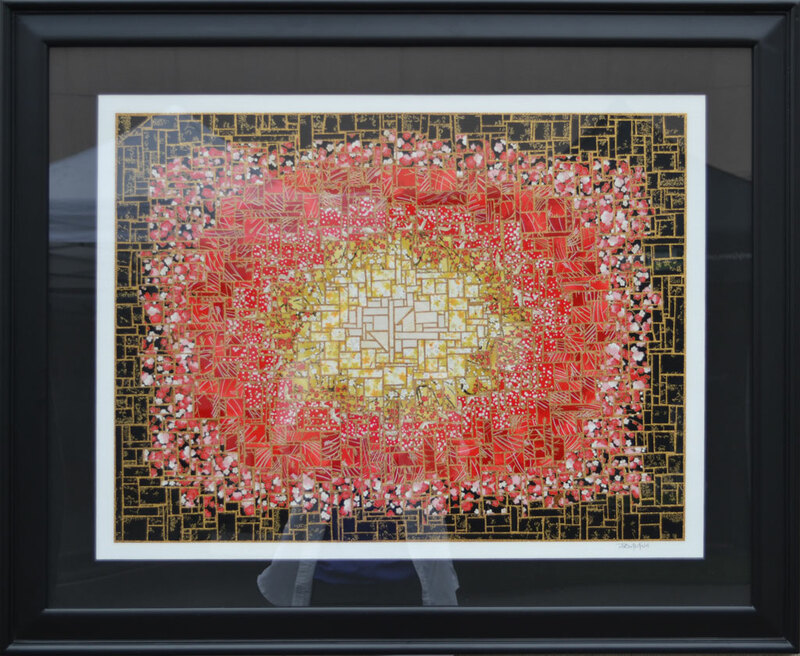 “Sunrise,” 24 x 30″ framed and matted, was one of the first large pieces I completed. It was my featured piece in the 2011 Art at the Source Open Studio Preview Exhibit in June, 2011. It took more than nine hours of paper placement, and it was well worth the time. I was thrilled when I brushed the excess glitter from the piece as it came together exactly as I had envisioned. This color combination, moving from outer rings of black to red to yellow, finishingwith white, brings to mind the sun in its brightness, obscuring the dark. Completed in the Eclipse style, it is a dramatic explosion of color. “Sunrise” sold in October, 2011, at the San Carlos Art and Wine fair to a very nice couple.